Tired of fighting with your teen? This isn’t the picture you imagined when your baby was born. You likely envisioned spending time together, laughing and having fun, not living through parenting power struggles. The good news is you aren’t alone and there is a way out. 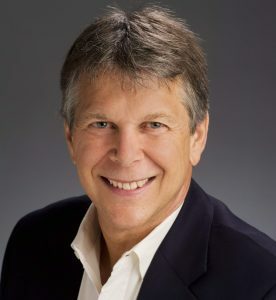 Mighty Parenting podcast hosts, Judy Davis and Sandy Fowler, interview Neil D. Brown to discover the real reason you are fighting with your teenager and the simple shifts you can make to end your parenting power struggles. Neil has a deep understanding of this struggle. He will enlighten us to the family dynamics that make things difficult, then he’ll guide us to the path of peace and a self-regulating teen. As a parent, it’s so hard to sort out your life and make time for all the things you want to do, especially when it’s about taking care of yourself. Judy and Sandy have a candid conversation about their own challenges with this issue, including a recent revelation from Judy. 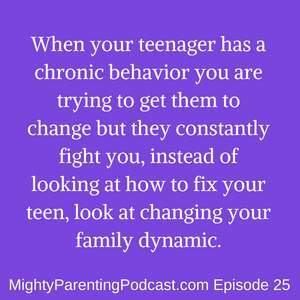 When your teenager has a chronic behavior that you are trying to get them to change but they constantly fight you, instead of looking at how to fix your teen, look at changing your family dynamic. A control battle is a situation where your teen has a chronic behavior that you are trying to get them to change and they are resisting. The more you try the more they resist and the more they resist the more you try. And the cycle continues. This pattern is not about the thing you were focused on originally, it becomes about the child avoiding and resisting and parents pushing. When a parent considers it their responsibility to change a teenager’s behavior. This makes the behavior the parent’s responsibility and the teenager is off the hook for it being their responsibility. We need to be able to parent in a way that gives our teens the message that they are in charge. We are in charge of the parenting, but they are in charge of those realms of development that belong to them. Wave the white flag saying “You win. You have taught me that I cannot make you do your homework; I cannot control you. That belongs to you. I will help you with your homework if you need it. I will help you set a schedule. I will love you, support you. I think you’re a great kid. I know you can do your homework. I know that sometimes you do need help and I’m happy to help. What I’m not going to do anymore is try to control you, that belongs to you. What I’m in charge of is giving you the privileges that you earn. In other words, if you want to play video games, if you want to be online, if you want to watch YouTube videos, or whatever, or go out and be with your friends, those are privileges and the way you get those privileges is to earn them. The way you earn them is you manage your responsibilities and you have a healthy attitude with your parents. If you want your privileges, fine. If you don’t want your privileges, fine. That’s up to you. But I’m not going to make you do your homework. Parents assert their power through non-struggling. Stay focused on privileges we dole out, that they earn. When we are in a control battle and take something away from our teenagers, they see it as you doing something to them and see themselves as a victim. Fighting doesn’t necessarily mean you are in a control battle. When there is a chronic tension between parent and child, if the parent is walking on eggshells around their kid and the kid always feels like they are about to be in trouble, then it is likely a control battle. Another indicator is that there is a behavior that needs to change, and it isn’t changing. This can be a control battle and/or there may be an underlying reason for the problem. When parents live through this long enough, they can end up in a diminished capacity and experience parental burnout. Parents need to have faith in their kid, have a healthy vision of who their child is, believe in them, and communicate that belief in them. Realize your teen is on a journey from childhood to adulthood and there may be challenges on the journey, but your child can make it. “Hey, you’re a great kid. I know we’re having a hard time here, but we’ll figure it out. I have faith in you. I know you’re annoyed with me right now because I’m telling you no to these things you want, I’m annoyed with you because of your attitude toward me and your attitude toward your responsibilities but we’re going to get through this because you’re a fabulous kid and I know that and you know that.” Then catch them doing things well and acknowledge that. When both parents are divorced and aren’t on the same page, you need to have integrity in your own situation. Have your household run with standards and with accountability to those standards. Add in a lot of positivity. When both parents aren’t on the same page, you can tell the kid that in order to get a yes, they have to get a yes from both sources. If kids experience one parent having high standards and integrity, the kid feels it and are likely to respond to it. If kids are in control battles, they are learning a negative identity, negative skills and negative behaviors. They can get good at them and they can become life skills. Conversely, if we use an ending-the-parent-teen-control-battle model for moving forward, they learn to manage their emotions, how to manage their responsibilities, how to learn, how to grow, how to develop a positive identity, and how to experience success. We all face challenges in doing our self-care, especially as family schedules change. We often say we lost control of our schedule or our lives but is it true that we lose control or really that we give up that control? Judy says she gives up her time when she sees someone living with pain or stress. She believes she needs to help them feel better. Sandy says she gives up her time when the family needs to sort things out or organize life. She believes she needs to make sure everything is organized, running smoothly, and all the problems are solved and plans are laid out. The question is: Is the true? Is that our job, our responsibility? When we give away that control we can get resentful. The challenge is to find the place where we can be accountable to our family in a healthy way, balancing it with being accountable only to ourselves. We need to determine the foundational coping strategies that we need to stay healthy. Then we need a way to make those part of our life. That involves communicating with our family about our needs and being willing to change things to allow us to do what we need to do to take care of ourselves. Grab your copy of Ending the Parent-Teen Control Battle today!